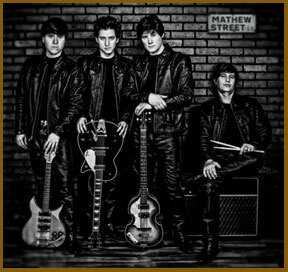 The Cavern Club at 10 Mathew Street, in Liverpool was the venue where the Beatles' (formerly known as the Quarrymen) UK popularity started. John Lennon, Paul McCartney, George Harrison and Pete Best were first seen by Brian Epstein at the club. Epstein eventually became their manager, going on to secure them a record contract. Best was replaced by Ringo Starr on 16 August 1962, which upset many Beatles fans. After taunts of, "Pete forever, Ringo never! ", one agitated fan headbutted Harrison in the club. The Beatles' name was first noticed by Brian Epstein in the first issue of Bill Harry's Mersey Beat magazine (which Epstein successfully sold in his NEMS music store), on numerous posters around Liverpool, and on the front page of the second issue of Mersey Beat before asking journalist Harry who they were. The Beatles—then consisting of Lennon, McCartney, Harrison, and Best—were due to perform a lunchtime concert in The Cavern Club on 9 November 1961, as part of a residency, for £3, 15 shillings a concert. According to Sytner, Epstein had visited the club quite a few times previously on Saturday nights, once asking Sytner to book a group for his twenty-first birthday party. Epstein asked Harry to arrange for Epstein and his assistant, Alistair Taylor, to watch the Beatles perform. Although Epstein had had no prior experience of artist management, he made it clear that he wanted to change the Beatles’ early dress-code and attitude on stage, as they wore blue jeans and leather jackets, smoked, ate and swore, stopped and started songs when they felt like it, pretended to hit each other, and turned their backs to the audience. Epstein put a stop to their behaviour, insisting they wear more suitable clothes, and later suggested the famous synchronised bow at the end of their performances. Copyright © 2018. Edge Entertainment Limited.